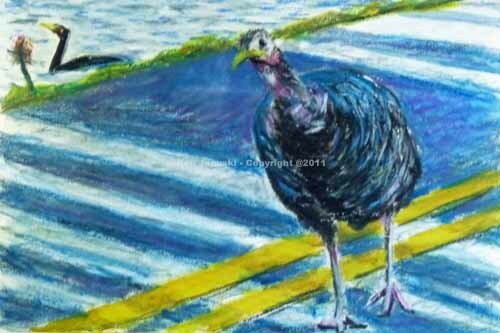 When we visited Metzger Marsh in Ohio near the Ottawa NWR last May we abruptly stopped one day as we saw a Wild Turkey along the road. As he seemed oblivious to us and let me sketch and click away we began to wonder just how wild he was. Across the road in the Neocolor II Crayon drawing/painting above is a 'yacht club.' Was he the official mascot? I'm sure not. But there was something oddly tame about him, as though he was quite accustomed to humans. When we see Wild Turkeys in the wild they're gone at the first recognition of us, often from 100 yards away or more. There is a small canal that runs along the 1-mile road out to Lake Erie. We found all sorts of warblers in the woods along the lake last May. In the canal were numerous egrets and herons, and I guess a Double-crested Cormorant or two. It was only when I got home and looked at my photos that I noticed a picture of the turkey with a cormorant in the background. This is not it. It's a composite of various views. But I've always been struck by the odd juxtaposition and yesterday finally decided to do something about it. As I mentioned above I used Caran d'Ache Neocolor II water soluble crayons. I bought them before our trip to Ohio in the hopes that I'd use them to add color to my field sketches. I've tried watercolor pencils in the field and gotten nowhere. Pretty much the same with Pitt Artist's felt tip pens. So I thought I'd add crayons to the arsenal. I never had the occasion to use them on the trip but I have used them in the studio. The nicest thing about them for me is that it's easier than with most media to paint light over dark. Often, as in watercolor or felt tip pen, you just can't get a clean light color over a darker one. And given my penchant for changing my mind as I go along I like to have that option. The other nice thing is that these are water soluble. So you can also use a wet brush and turn the drawing into something like a watercolor. Then you can go back on top with the crayon to add vibrancy or detail. More than anything I think this type of drawing/painting serves as a study. I can work out an idea and get some feeling for whether or not it's worth more development in another medium. 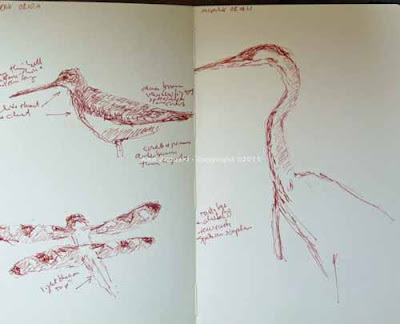 I'm also using the hardworking Stillman and Birn Gamma sketchbook for this. They really are sketchbooks and at least this part of the series, Gamma, is not meant for all the water I put on it. Still it doesn't break down. It warps a bit but not enough that I can't work on it. So for me the combination of sketchbook and crayon work very well for my artistic experiments. Yesterday when we prepared, as best we could, for Hurricane Irene's impact my main thought was WIND. Rain could be so strong as to flood our basement but wind could both bring down trees and cut our power and bring down trees on our house or car. There is a huge Silver Maple in a neighbor's yard. I've always preferred to have trees than not, unlike many of our neighbors who seem to consider the leaves a nuisance. But with ground that was already saturated with record-breaking rain, 6-12 inches predicted and winds of up to 70 mph I wondered just how stable that maple was. So wind was on my mind. I remembered a photo I'd taken last May of a Green Heron landing in a far tree in the wind at Magee Marsh in Ohio. It seemed like a good subject for a 15 minute flash watercolor. It's at top. Due to rain and distance I really couldn't see any color - just some varations in blue-gray. Yesterday was so dark that the light just wasn't good enough to undertake anything major. And of course we never knew when we might need to drop everything. Eventually the boredom of waiting for the storm took over though and I started something a bit more developed based on some photos of an Ovenbird from a number of years ago. Oddly we never saw much of the anticipated wind yesterday. I was up very late and still didn't see signs of a really strong wind. Today though, now that Hurricane Irene has been downgraded to Tropical Storm Irene, the wind has really picked up. The recently trimmed Silver Maples outside the window are whipping around and the panes in the window are rattling. It really LOOKS more dangerous today. 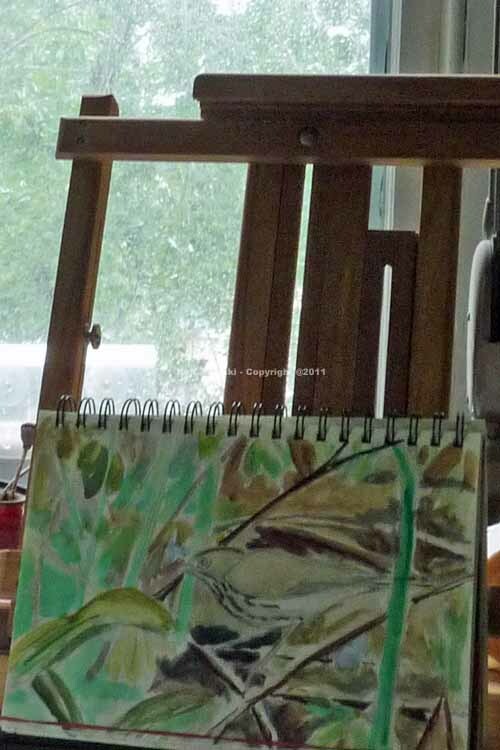 The photo above shows the early stages of the ovenbird watercolor, which I may or may not continue. It's really not very inspiring at the moment. The photo also shows the maples outside my window. Unfortunately it doesn't really show how the limbs are being whipped around. And the bird feeder attached to the window is full of food but empty of birds. I bought new bird food on Friday and I don't think I've seen a bird since. Hurricanes do odd things. Ocean birds are being reported all around, having been blown off course by Irene. And the local birds? Maybe they're just hunkered down, waiting for this wind to end. It's been an eventful week for nature. One day the floor is moving thanks to a 5.8 earthquake. A few days later we're preparing for a hurricane and then a tropical storm. Cape May where we vacationed just 10 days ago just had an evacuation of 750,000 people. When sun and normal weather returns it will be like a visit from a barely, recognizable stranger. 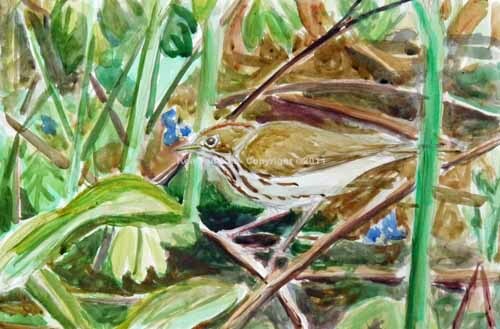 After I posted this I realized I needed to try to salvage the ovenbird watercolor. This is done now. It could use more work but it's on sketch paper not watercolor paper. So it's time to leave it be and save any future versions for good watercolor paper. I suppose in any field you hear a truism and assume it is true until someone tells you otherwise. I've always heard and read that Long-billed and Short-billed Dowitchers could really only be told apart by call. But shorebirds are not my area of expertise. Perhaps if I'd seen more of them I'd know this isn't true. In any case the shorebird workshop mentioned in the last post spent a fair amount of time showing how to differentiate them. 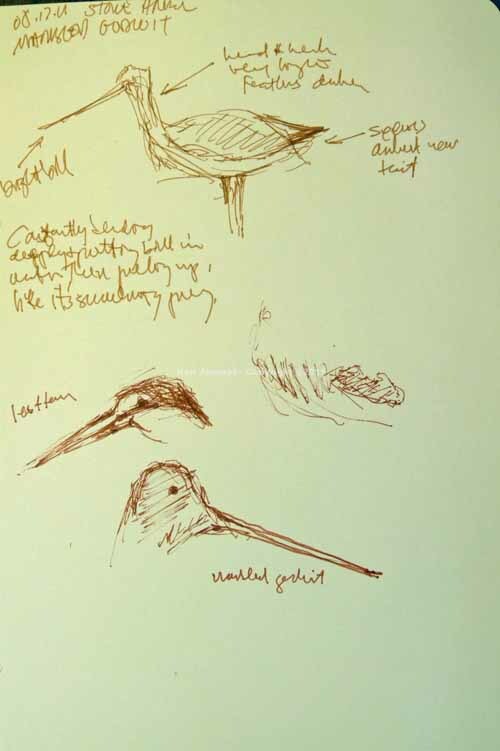 But even after all that when I saw the mystery dowitcher that I spent an hour sketching and photographing I thought it was a specific race of a Short-billed Dowitcher. Head molt starts earlier than body molt so many late-summer birds have agray-headed, salmon-bellied look. The gray head with salmon wash on neck and going into belly was one of the most striking parts of this bird. 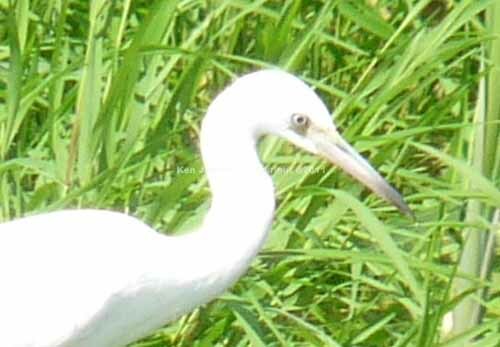 That, the long bill, the rich colors of feathers, and the 'swallowed-a-grapefruit', hunched look all make me think this was a Long-billed. And I'm sure if I remembered everything from the class I could cite a couple of other reasons. In the long run it doesn't make much difference. 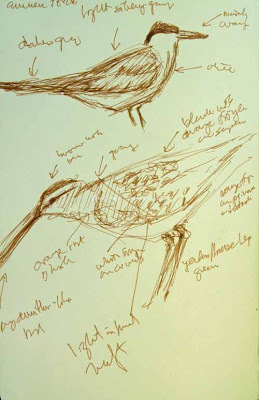 But for me part of the enjoyment of birding is trying to make difficult IDs like this. One side note: hardly had I started this than our whole house shook. The cats appeared in the hallway with wide-eyed looks. Yes it felt just like one of those earthquakes I used to experience in California. And it was: a 5.8 one centered in Virginia and felt all the way to New York. I think I wrote a few months ago about how the study of geology humbles you. And to actually feel geology is probably doubly humbling. It's so easy to think that our lives and what goes on in them, including the most idiotic headlines in sensationalist news, are what's important. Then the ground wiggles under you and you have second thoughts. It's been quite awhile since we took a birding workshop. We learned to bird taking them at Pocono Center for Environmental Education about 15-20 years ago. 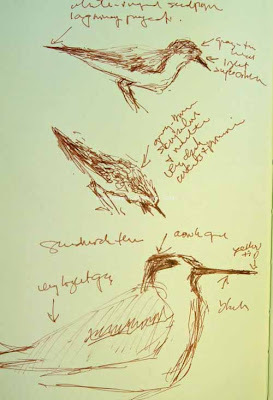 The last we took was at least 8 years ago, a week long course on Spring Migration at Cape May Bird Observatory. We couldn't have made a better choice. 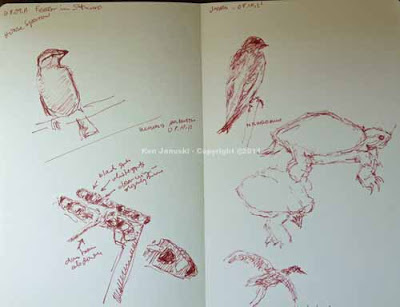 Michael, along with his wife, birder and artist Louise Zemaitis, is a wonderful and extremely knowledgeable birder and teacher. At the end of our three day course we finally feel somewhat comfortable with shorebirds. More than that we both feel that we've learned how to look at them, so that we can figure out what something is when we see it. 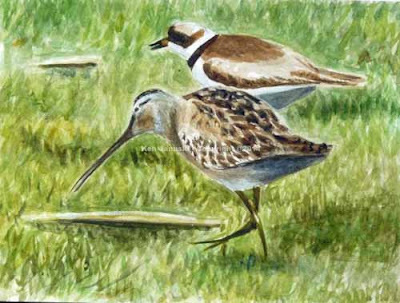 That said almost as soon as the course was over we were faced with a bird that looked exactly like a dowitcher, more likely Short-billed than Long-billed, but behaved much more like a Pectoral Sandpiper. Last night as I looked at my guides, photos and field sketches I still wasn't sure and started to lean more towards a Long-billed Dowitcher. That's really not important though. 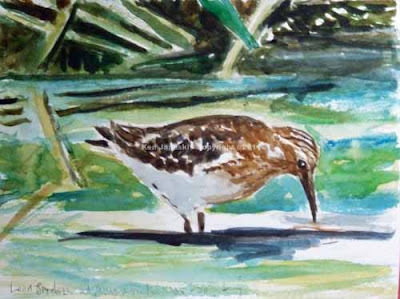 What I think we both find so exciting is that we are now able to look at a shorebird and figure out how to decipher what we see. 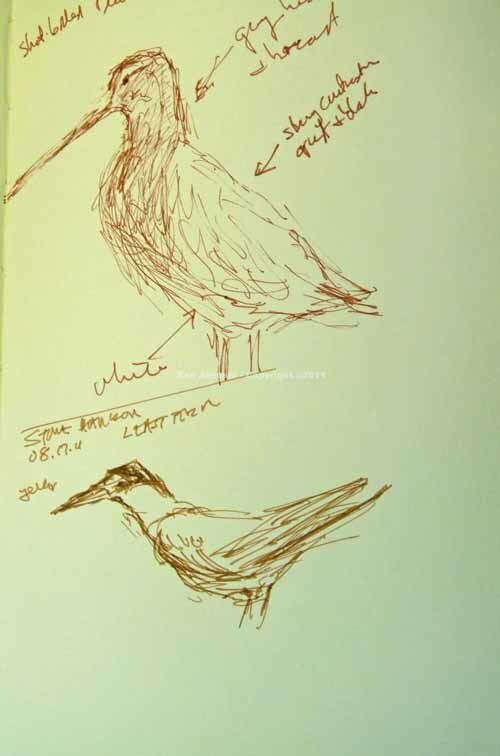 The sketch above includes the mystery bird below and a Common Tern above. One bonus about this week was that terns were included free. Everywhere the shorebirds were we seemed to see some terns as well. 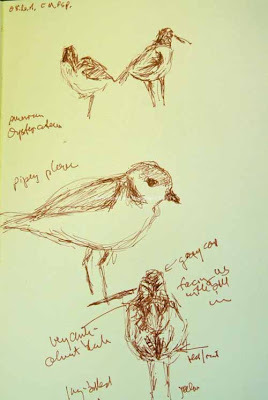 They are also pretty unfamiliar to us so I spent a lot of time sketching them. At top are some of the first birds we saw: two American Oystercatchers, a Piping Plover, and a Long-billed Dowitcher, facing away but with his head turned 180 degrees and buried in his mantle. 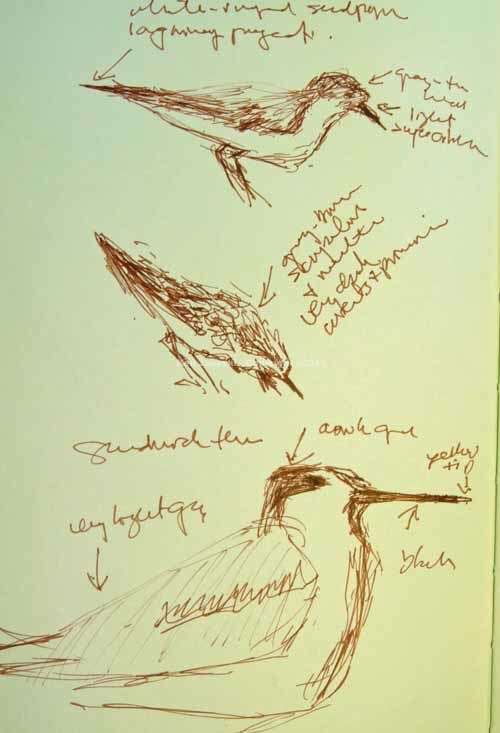 As you can see I spent much of my time trying to sketch and annotate diagnostic field marks of the various birds. 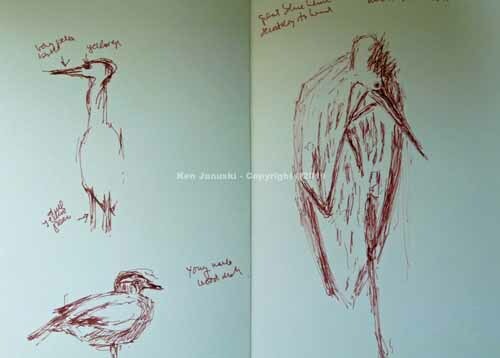 We did see a wealth of birds. I'm amazed that I was able to sketch so many of them during the course. Below two sketches of a distant Marbled Godwit with a Least Tern in between. Next a very small Osprey which seemed it must be an immature, except that his plumage indicated adult. And with him a Caspian Tern, that stayed just long enough for this sketch. Next an immature Great Blue Heron drying his wings. 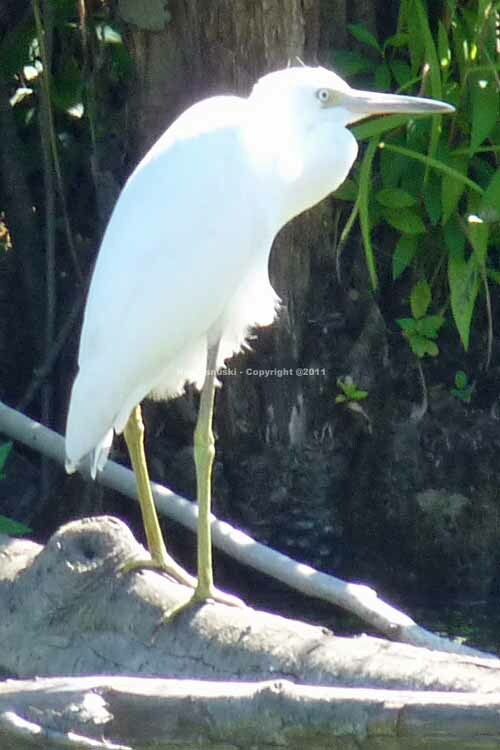 I skipped most herons and egrets I saw this trip but this pose was too striking to pass up. Now some young Piping Plovers, almost invisible on the sand of Stone Harbor. One of the surprises of this part of the trip was the discovery of Loggerhead Turtle tracks, seemingly there to lay eggs. A naturalist with the group recognized them. The local naturalists said they had no knowledge of any sea turtles ever trying to lay eggs in this area. I've not yet had time to read up on them or to find out whether this is a real nest or a fake nest, which is always a possibility with Loggerheads I guess. 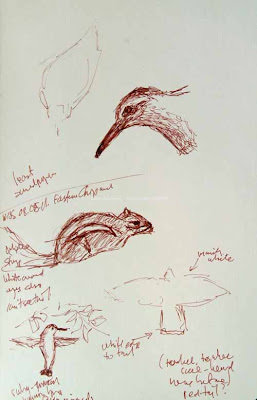 Local naturalists are pursuing this. 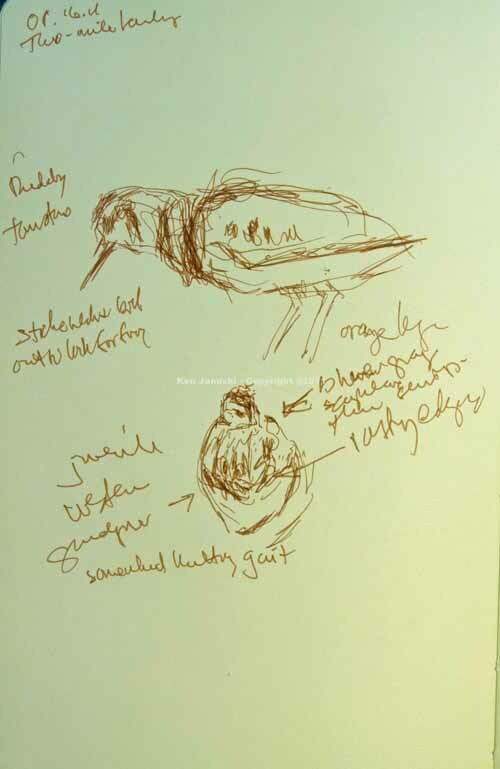 Moving from sea turtles to a Ruddy Turnstone with his head stretched out looking for food, and a juvenile Western Sandpiper, complete with notes as to why this is a Western and not a Semi-palmated. A Short-billed Dowitcher with Least Tern below. 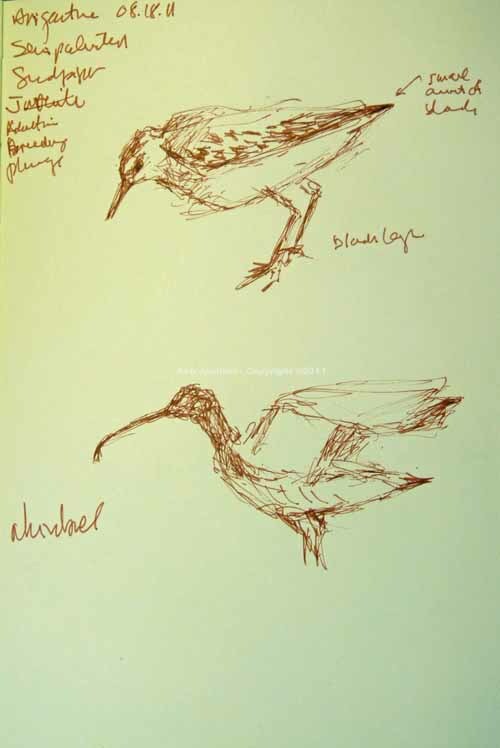 Two of my favorite sketches: a juvenile Semi-palmated Sandpiper with bright, fresh plumage and a distant Whimbrel who raised his wings momentarily. One of the things I love about field sketching is being able to capture moments such as this. The only way to do it though I think is with constant practice. 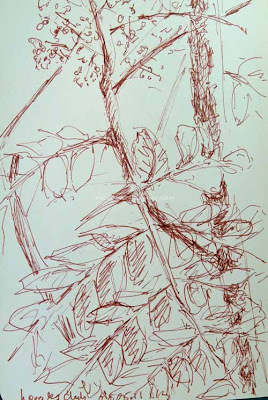 The more you sketch the better you get AND the more chances you have to see something like this. As I've said before it can easily become addictive. And finally two White-rumped Sandpipers and a Sandwich Tern, both birds we've never seen before. Our vacation was short, just three full days and two partial days. But it was one of the best ever. 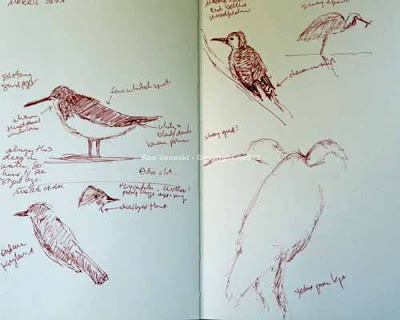 Fresh, invigorating ocean breezes, new birds, a very knowledgeable and effective teacher and many field sketches. It's hard to ask for anything more. Sometimes when I struggle with identifying an unusual bird I like to do some sort of art work that solidifies what I learned about the bird. Often though I get seduced along the way by other factors. In this case I liked the idea of showing a second Little Blue a bit further back. 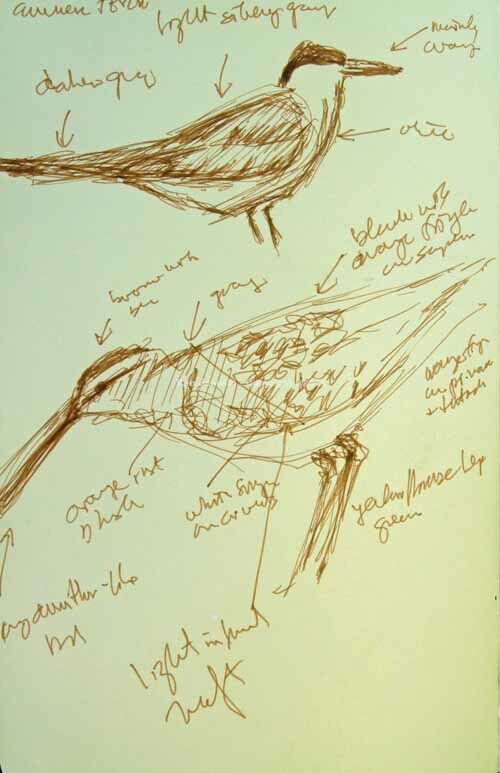 That meant less space for the primary bird and thus not much detail So I never really did much detail on the bill. And the greenish legs, a diagnostic characteristic, get lost a bit in the overall green of the painting. So it has ended up being a more artistic painting than a scientific one. Still there are elements of both. And sometimes you just need to get started. With this done I wouldn't be surprised if I eventually try a few more of this subject. Finally I like the idea of commemorating this unusual event for Philadelphia. I'm happy with that. Now I just need to do another, slightly more vibrant painting. This painting by the way is much more satisfying than the two I did of the White Ibis at Tinicum last month. I think that's because of the effort spent in just identifying the birds. Also I never saw the birds like this. It's a composition of other real life scenes. It's almost always more exciting to try something like that. 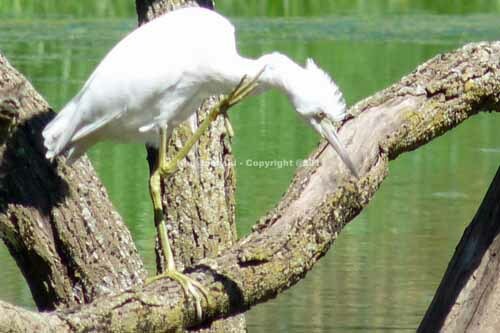 Errands brought me into the vicinity of Morris Arboretum this morning so I had to stop and take a look at the mystery heron/egret. I'd pretty much decided it was a Snowy, based mainly on the markings under the eye, the typical poses which seemed more like a Snowy and the relative rarity of Little Blues. I took numerous photos and did some more sketches. While there I ran into some people who told me a local birder had called them immature Little Blues. I wasn't convinced. But when I got home I did pull out one more guide to look through. This one, the Stokes, showed a photo much like what I'd seen. And seeing it again it was hard to deny that the legs were one solid color and that was more green than yellow. Also the bill does seem broader and thicker and bends down more than I think is true of the Snowy. Things that leave me with some doubts though: the markings of bill under eye seem more like Snowy, and the poses seemed more like the many Snowies I've seen than like the few Little Blues. Nonetheless I think immature Little Blue is correct. In spite of many views of the last post I heard nothing from anyone on PA rare bird listserv with their thoughts. Perhaps with these additional photos. 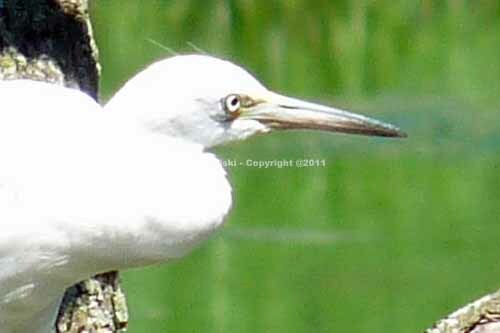 AND they have: a number of people have confirmed this as an immature Little Blue. Thanks to you all for your emails. Above a sketch of an immature Great Blue Heron, which has been at Morris last couple of days. 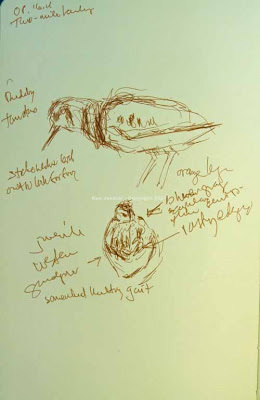 Another sketch of the Solitary Sandpiper, an Eastern Kingbird and just the start of what I'd guess was a Willow Flycatcher. Also the Little Blue, which didn't sit still for long, and a far-off Red-bellied Woodpecker. 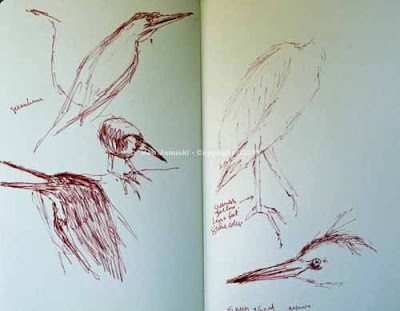 Finally a Green Heron, one of two I saw today, and more sketches of the immature Little Blue, which just wouldn't sit still. 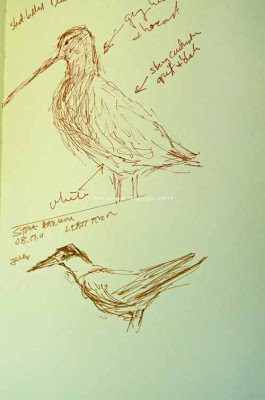 Every once in awhile I'm out birding and sketching and am not sure about the ID on a bird. Such is the case above. The pale bill is the first thing that threw me. 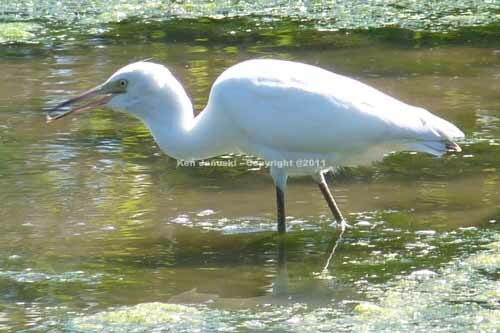 I'm used to seeing Great Egrets at Morris and assumed that's what it was. But the color of bill and legs seemed wrong. Size is always hard to gauge without something to compare a bird to but it seemed small. 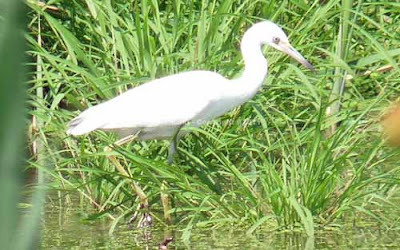 When I got home and consulted my guides it seemed almost as likely to be a juvenile Little Blue Heron as a juvenile Snow Egret primarily due to color of bill. But the actual shape of bill, and the greater rarity of a Little Blue, make me tend toward a Snowy. I've posted a query to the Audubon PA rare bird listserv and am posting the photos above so that anyone who reads that post can check these photos. 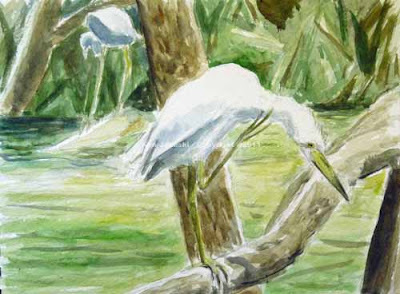 I was primarily interested in doing field sketches at Morris but I didn't get far with the two mystery egrets. Only toward the end of my visit did I realize that there were two. Most of the day I was looking at just one but it was just too far away to get a good look at in scope, and it rarely stood still. The sketch above shows it as well as a juvenile male Wood Duck and a Great Blue Heron that was scratching his head. 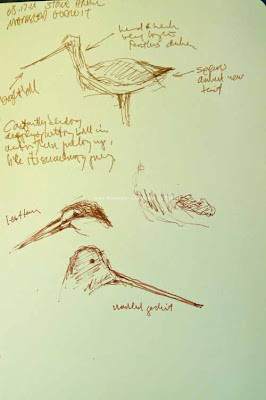 Below a few more field sketches. First a Solitary Sandpiper, with a bill that seemed suprisingly sharp and long, a Twelve-Spotted Skimmer and the same Great Blue Heron. And second: a female House Sparrow, sketched at home before heading out, another 12-Spotted Skimmer, a Northern Rough-winged Swallow, a Painted Turtle in two poses, and a Great Blue Heron just after it flew over my head. And finally another Odd and End. 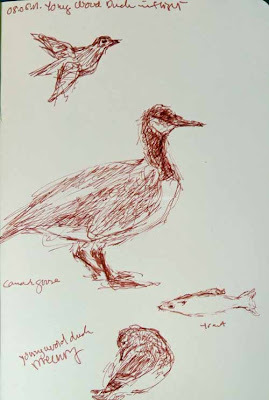 This is a Caran d'Ache Neocolor II crayon with wash based on some photos of Common Moorhens seen at Metzger Marsh in May, 2011. 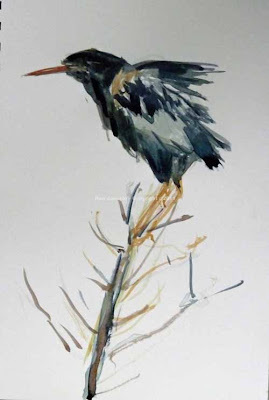 When I began this blog about 3 and a half years ago I used one of my first bird paintings as the header. Some of you may have noticed that the header has changed. And about time some might say! Three and a half years is a long time in internet time. But internet time can also be a harsh, and foolish, taskmaster. Who wants to try to keep pace with internet time? I'd rather have a life. The first header was of a Blackburnian Warbler and so is the new one. I'm quite happy with the last reduction linocut so I wanted to showcase it. Since it's also of the same bird it seemed like a good idea to make the switch. In a sense the two works show the beginnings and end of a journey. The early watercolor was one of my very first bird paintings. In it I think I stayed closer to abstraction than to realism. 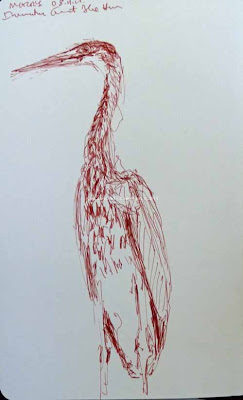 I liked the boldness of it but I also felt guilty about not knowing enough about the bird to stay true to it. 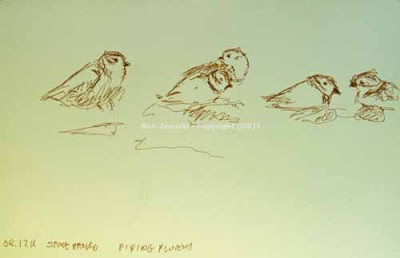 Five years later I feel that I now know quite a bit about portraying birds. So the new print to me seems a happy combination of abstraction and realism. That's what I wanted when I started with birds and I think I've accomplished it. In any case this explains the new header. You may not have guessed it but the multi-color reduction linocut was a lot of work. I totalled up all my hours and they're almost 50. After such intense work it's nice to do something less demanding. 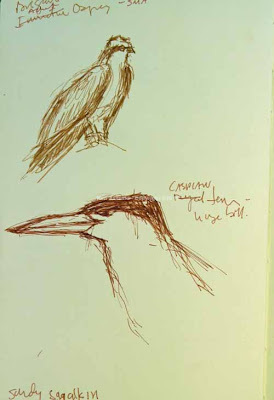 So I've been out field sketching, taking photos and doing small studies based on both. The small watercolor at top is a Least Sandpiper, based on field sketches and photos from Morris Arboretum last weekend. 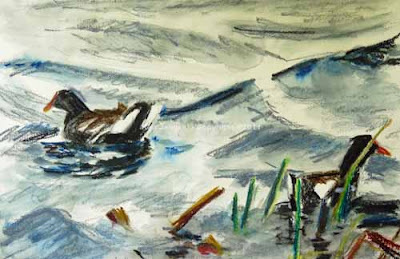 I still haven't gotten free, or accomplished, enough with watercolor for my work in it to be a successful blend of realistm and abstraction like the linocuts. But I keep working and playing at it. This is one such attempt. Today was a cool morning for a change so I took advantage of it and took a lengthy walk along the Wissahickon Creek in Philadelphia. Above is a field sketch of a Least Sandpiper from last weekend as well as some birds seen today: a Ruby-throated Hummingbird, Eastern Chipmunk and Red-tailed Hawk. Only the chipmunk sat still for more than a split second. The other two birds were in flight. Above a Canada Goose from this morning, along with a Wood Duck taking off as I scared him out of water, a less shy Wood Duck preening itself and a trout in the creek.
. These prickly shrubs are just starting to form flowers. Soon they'll bloom, then form berries, then be inundated by birds, mainly warblers and thrushes. 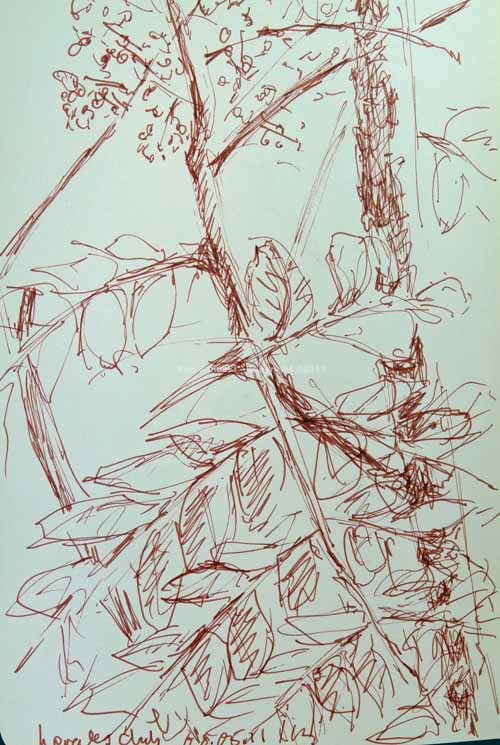 I just wanted to do a quick sketch of one as the flowers start to form. 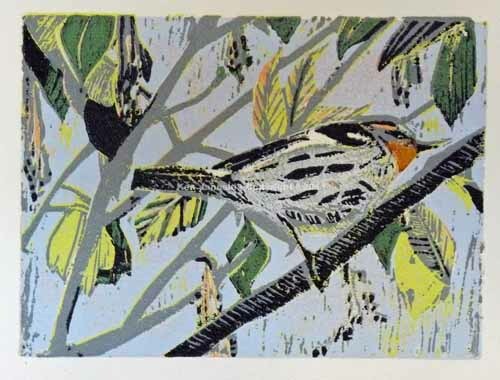 I've just finished the linoleum block reduction print of a Blackburnian Warbler seen at Magee Marsh in Ohio in May, 2011. This print has been an ordeal, using 8 or maybe 9 or maybe even 10 colors. But in terms of color it's pretty much what I wanted. In terms of registration well maybe not. Without a sophisticated registration system, and perhaps even with one, a print with 8 to 10 colors might not have the best registration. Still it's probably better than your average newspaper! The difference is that I don't care all that much. I don't want total chaos but I do like the happy accidents and forced inexactitude that many colors creates. This could easily sound like an after the fact rationalization. But it's not. I just don't like finely done art, at least not from my own hand. I can admire it in the work of others. But for myself I start shaking when I verge to close to exactness. It's just not my character. 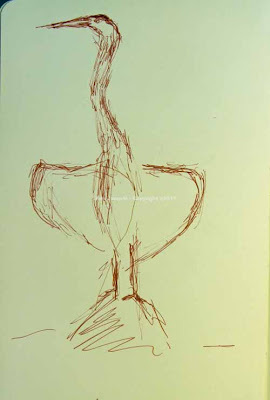 When I was a child I read something that said Native American artists(Indians in the lingo of the time) often left a mistake in their crafts because something that was perfect was a challenge to the gods or something like that. I'm sure I'm misremembering it. But it stuck with me. Who knows whether it had any influence on my aesthetics. I doubt it. But it is funny how I think about it as I verge away from anything that is too finely done. I'm not sure how many readers are familiar with reduction linoleum block prints. 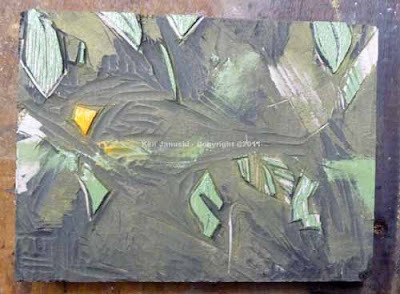 What it means is that as you print one color you carve it away from the block after printing. By the time you're done there's almost nothing left to the block. The photo above shows what's left in the final inking. I'm getting fancy here and using two colors, the final green and a new orange for the throat. The smudges on the block are where the inking brayer tilted and got ink where I didn't want it. So I rubbed that area off before printing. The final edition of this is 12, with 4 artist's proofs. They are nearly the same as the final edition. Because of the complex registration each print is really almost unique. The paper is 9x11 inches and the image itself is 6x8. I've used Gamblin oil-based ink and hand pulled each print on Rives Heavyweight paper. Eventually one or two will go up for sale on my Etsy site.